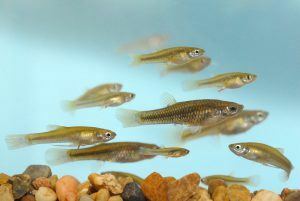 TUCSON, Ariz. – After an absence of more than 70 years, the endangered Gila topminnow has reappeared in the Santa Cruz River in northwest Tucson, fish surveys conducted in November confirm. * This is a joint news release between the Arizona Game and Fish Department, U.S. Fish and Wildlife Service, USGS Arizona Cooperative Fish and Wildlife Research Unit, Pima County Regional Flood Control District, University of Arizona Department of Ecology and Evolutionary Biology, Sonoran Institute, Tumacacori National Historic Park and the Friends of the Santa Cruz River.